Our registration process is all online. First time registrants will create an account in order to access the registration. Returning families will use your email and password from last year to access your account and the registration. Completing registration should take about 30 minutes. You will need the camper’s immunization record, health insurance information, and physician’s contact information to complete the medical form. You are able to save your progress along the way and pick up where you left off later. A $150 deposit is required to secure your registration. This will be the last step before submitting your application. 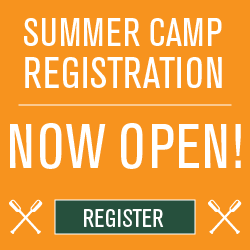 After submitting your registration application, you will be required to download the Camper Physical Form which must be completed by a licensed healthcare provider and uploaded to your camper’s account before their camp session. A sports or school physical is acceptable as long as it’s dated within 12 months of your camper’s session. If you are applying for a Camp Hardtner scholarship, this is a separate process from registration. Please see the Summer Camp Scholarship webpage. If your church or another organization is paying all or some of your camp fee, please have them contact our office to confirm the details. We are available and happy to help should you have any questions about our summer camp program or about the registration process!